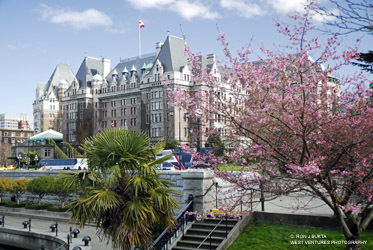 The Empress Hotel is an early-20th-century stone hotel, constructed in the Chateau style. 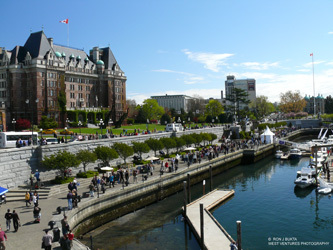 It is prominently located at the head of the inner harbour in the city of Victoria. Built for the Canadian Pacific Railway (CPR), the Empress is one of a series of Chateau-style hotels built by Canadian railway companies in the early 20th century to encourage tourists to travel their transcontinental routes. Popular with the travelling public for their elaborate decor and comfortable elegance, these hotels quickly became national symbols of quality accommodation. The Chateau-style vocabulary used by the railway hotels evolved as a distinctly Canadian architectural type. The Empress signals the beginning of this evolution from a strictly Chateau-style design towards one that incorporated contemporary forms. Built in 1904-08 to designs by Francis M. Rattenbury, the Empress was enlarged in 1910-12 to designs by W.S. Painter and in 1928 to designs by J.W. Orrock. It is an important visual clue to the harbour – the reason that Victoria was chosen for the Hudson Bay Company Fort north of the new American border – and its proximity to the Legislative Buildings (Rattenbury, 1897) illustrate the architect’s grand plan for this important harbour. Built after the draining of the James Bay mudflats and the construction of the Inner Harbour Causeway, the hotel would be first thing that travellers arriving by water, presumably on a Canadian Pacific ocean liner, would see. William Harbeck was said to be so impressed by the site of the hotel rising from the ground that he stopped in his tracks and rotated his camera to catch a panoramic view of the entire harbour.